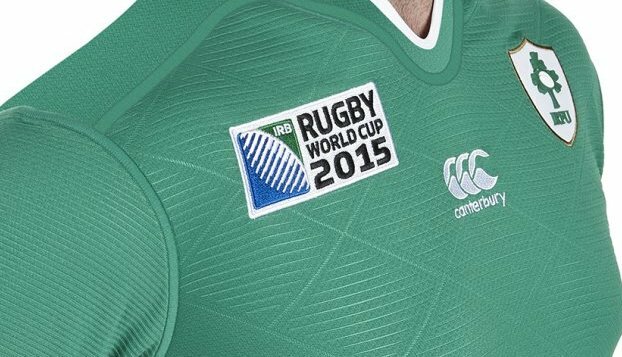 The new Rugby World Cup shirts were launched today at a fan event in Galway, and there are a fair few similarities with the new England shirts that were launched last week, as you’d probably expect given that both shirts have been produced in tandem. So, we get the same super-light materials that made the new England shirt, the same ‘360° Loop’ neckline (which means no place for the retro, old-school collar, which we’re a bit sad about we have to say) and of course, the same 3D injection-moulded badge that caused so much excitement and conversation with the England shirt. Another similarity is the use of a chevron design around the top of the shoulders. Interestingly, however, where the new England kits used V-shaped ball-deadening grip to create the effect, the design here uses a series of ruled diamonds to create the shape instead. 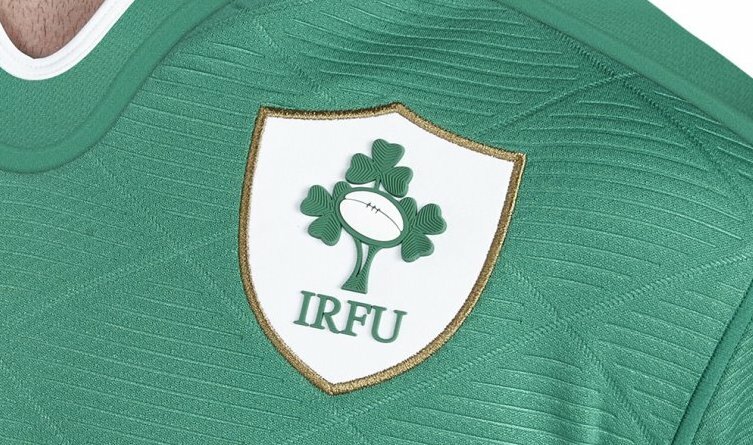 We think it looks very cool – there’s something very retro, very old-school about it, which has been a definite theme of Canterbury’s Ireland designs so far. Speaking of definite themes… what’s with all these chevrons?! By our count now, this is the fourth World Cup design that has some kind of V-shaped chevron design on it. England, of course had the grip tape, the All Blacks had their, ahem, ‘unique’ chevron design in tribute to the 1905 originals, and even the new Samoa shirt from BLK had a bit of chevron-y ness to the tribal design. It’s funny how these trends seem to happen in rugby – from subtle hoops to contrasting back and front jerseys, these things tend to come in bunches. We’re not sure how well rugby union’s appropriation of the chevron is going to go down with fans of the 13-man code, but we dig it. That injection-moulded 3D badge is again one of the most striking features of the design – it’s perhaps not quite as impressive as the England rose, but maybe that’s because the trick doesn’t have the same impact second time around. Notice, however that the badge has some gold piping around it – that’s new. Perhaps it’s CCC’s way of marking Ireland’s success on the pitch, but it looks pretty cool. 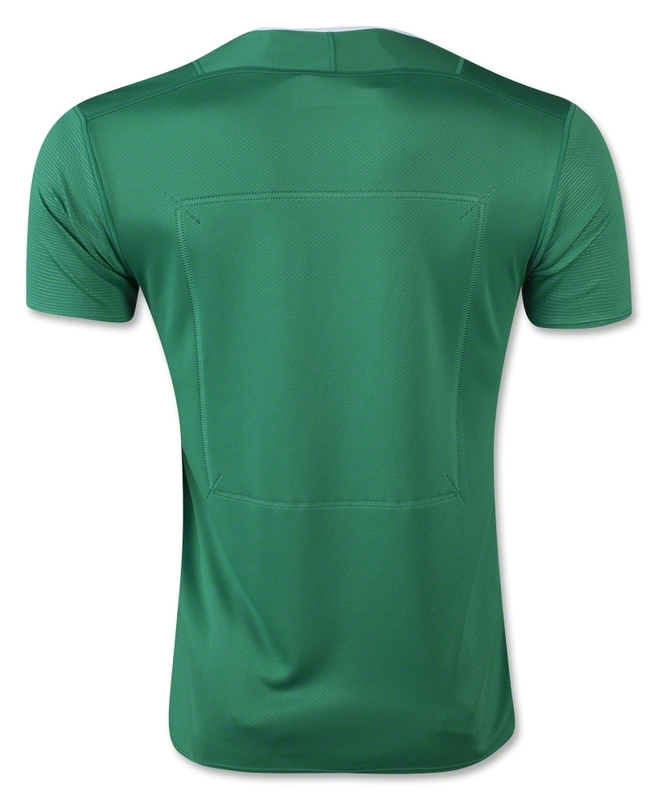 Round the back, it’s all pretty clean and simple – like on the England shirts we have a cool subtle box for the numbers. Combined with the retro V pattern on the front it’s quite the modern-vintage package, and it all hangs together very well. 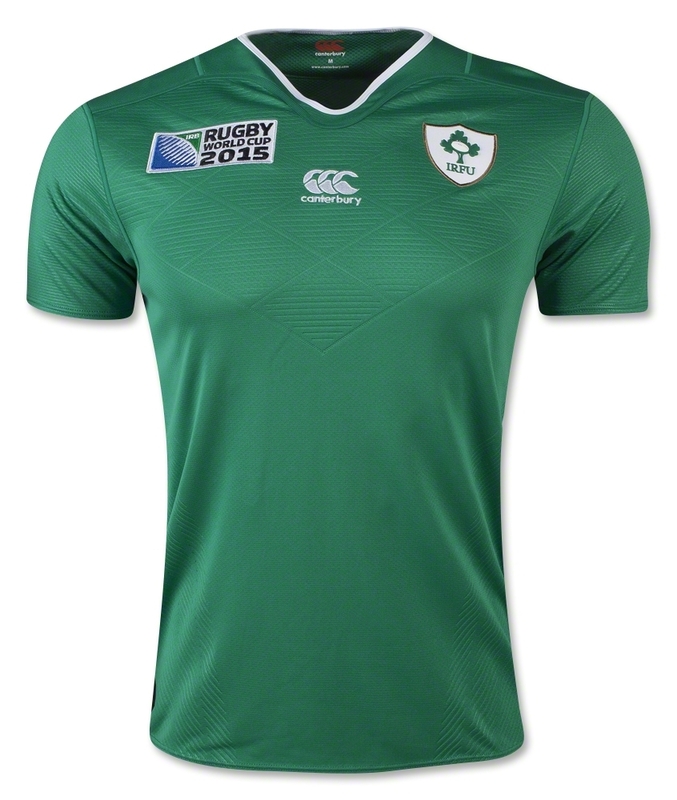 Canterbury’s second tilt at an Ireland home shirt loses some things that we liked about the last one, but adds some cool stuff that we really like, too. It strikes a really good balance between retro and modern, all the while keeping to Canterbury’s long-held ethos of maintaining a clean, classic overall vibe. Some people might gripe that that it’s very similar to the England shirt in a lot of ways, and that’s true, but when the England shirts were so great, that’s not really a bad thing, is it? Puma did a mutch beter job than Canterbury have did so far for The I.R.F.U kits in my view I.R.F.U should find another kit Supplier after the Rugby World Cup 2015. Checked this out in a store and the cashier told me that the players shirts permanently stains if you’re wearing any deodorant, any word on this? That… sounds mental. We’d recommend messaging CCC on Twitter or Facebook to ask, but that sounds stark raving mental, and we can say we’ve never had any such problems with any Canterbury stuff we’ve had.